For centuries, acoustic instruments have been the standard for orchestral musicians, solo players, and others. They offered a unique way for children to learn the basics of rhythm and melody, as well as to realize the physical nature of things, and how to interact with the world in an operational fashion. They were meticulously crafted, and were often carved with the user in mind. Once obtained, they were not expendable, as they were expensive and useful, costing a pretty penny and able to grant a prettier one. Performers and collectors, alike, pursued the finest of these objects; only the lucky or ambitious were able to claim them. Honor was given not only for a player’s skills, but also for the instrument’s quality. The body of the instrument has, surprisingly, not changed much over the years. 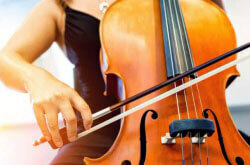 Toward the beginning of its history, the cello’s form was smaller, having been designed as a “bass violin”. It often stood with its base directly contacting the floor; no end pin held it in place. Soon after its first light of day, though, it gained the peg that holds it up, and, eventually, was expanded in size. Now, acoustic cellos retain a traditional wooden figure, with curved sides and f-holes cut into their surfaces. The bows that come with them are significantly thicker than their violin-accompanying counterparts, and a larger amount of hair is attached to them. Their cases are large and, some might say, cumbersome, often with wheels to help lighten the load. Since the 17th century, the cello has been used as the bass instrument in symphonies, quartets, and other ensemble compositions. They construct the foundation for the notes of higher instruments, providing a landscape and background upon and over which harmonies can graze and melodies can soar. Similar to the bass guitar in a modern jazz or rock band, or to the sub-synth in a trap or dub mix, they convey the underlying, emotional pull invoked by many pieces. With modern technology, the cello has evolved into a form that adheres to the standards of contemporary art. It was recently endowed with electric capabilities, and can now be connected directly into an amplifier. This allows for easy live usage and nice practice volume when unplugged. Along with this awesome asset come sleek designs. Unprecedented shapes now riddle the formerly classical instrument’s world – some electric cellos omit the original frame from their bodies, and feature only the fingerboard and what is beneath it. Many have the curved borders of acoustic cellos, but lack the interior sections that the others contain. Still others are full-bodied, and offer the same sound production that acoustic cellos do, but are colored (midnight black or pearl white, for instance) to indicate their different nature. As innovation advances, and humans continue to develop efficient designs, the amount of cello styles and figures increases. That said, a stagnant list will never contain the entirety of these products; however, one can offer a number of options, and can be as informative as entertaining. This article gives a limited list of items currently available for beginners and advanced players. The Stagg ECL has a classy color and shape that will impress onlookers and swoon passionistas. It is an opaque-white tone that reminisces the backdrops seen in photoshoots of this Internet age. It can contrast with any professional setting of visual art and clothing. A black fingerboard, head, and tailpiece make the cello a well-designed piece of art, enabling it to stand on its own as a visual piece. The cello’s structure is intriguing and inventive – its main body consists of the vertical post of the fingerboard and middle body of a regular cello. Shaped rods protrude from the body, allowing for the knees to hold the instrument, just as they can a normal one. A standard-beige bridge hold the strings – this, as well as the tailpiece and fingerboard, make the object recognizable as a cello. On the instrument’s side is a box into which headphones can be plugged. An output for a quarter-inch cable enables direct streaming into an amp. 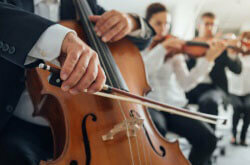 This makes the cello ideal for quiet, personal warmups and sonorous exhibitions in loud concert settings. Volume and tone knobs allow for audio adjustment directly from the user’s position. The Staff ECL is equipped with an active pickup, as well as a necessary battery cartridge, which can be easily opened and manipulated to charge the pickup. A standing post allows for the cello to be propped as any other cello could be. 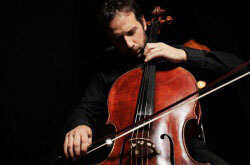 As the Staff ECL is not a full-bodied instrument, when unplugged, its sound is not the organic, round, and embodying one that acoustic cellos produce. It is comparatively dampened when without amplifier; however, when hooked up to a speaker, the cello sings volumes. Despite its lack of body, the cello speaks in resplendent tones, carrying the shining and life-giving frequencies of springtime, while bearing the boldness of the creatures that survived the preceding winter. The vibrations that emanate from this instrument are engaging, and can unfailingly swoon any audience. A combination of modern style and classical refinement, the Staff ECL is a wonderful tool for beginners as well as fully-trained musicians. The cello, an accompanying gig bag, and bow can all be purchased for about $700 – a mid-range price for instruments of its type. It can serve as a sweet graduation present, birthday gift, or thinking-of-you treat. Yamaha, known for its reliable guitars, amplifiers, and motorcycles, is a qualified company that has sold thousands of instruments worldwide. 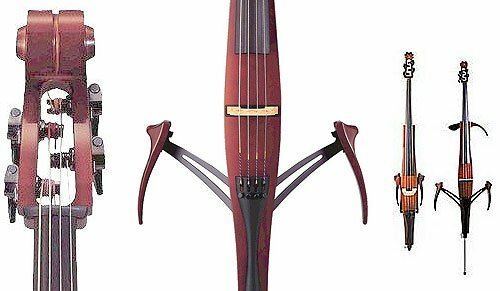 It is no wonder that they made a highly-reviewed cello that is as fresh as the figs of Egypt and as stylized as Hot Wheels cars. 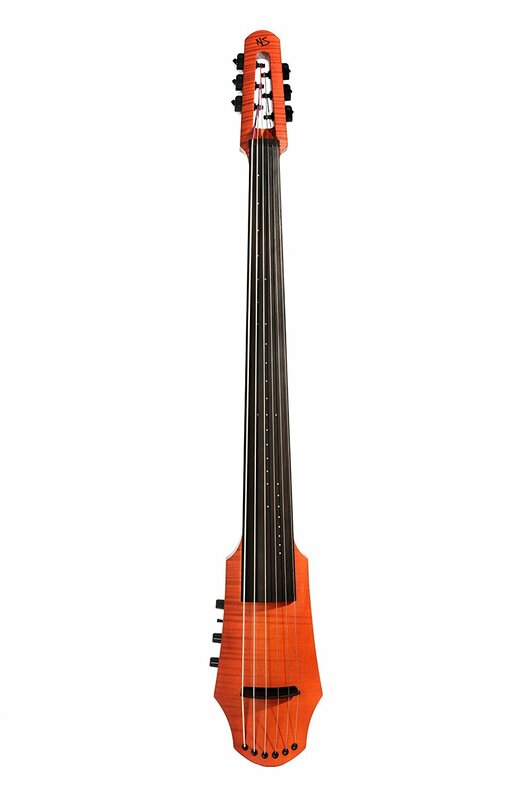 The SVC210SK is red-brown and black, with the shadings held by darker cellos. Its sheen is slightly glossy, with a smooth texture that is slick under touch and tempting upon sight. A traditional-beige bridge holds the strings up, preventing them from loosening or collapsing in on the instrument. Ebony fingerboard and tailpiece contrast well with the objects brown hue, while the headstock and tuning pegs are brown and silver, altogether comprising a cello that sits well in an orchestra. The cello has a retractable, silver standing peg, which can be adjusted to provide height for people of formidable size. Collapsible knee and arm rests are situated on the cello’s sides, allowing for players to rest the electric outfit on themselves as they would a normal cello. The bottom extensions are shaped like the wings of a podracer, while the upper ones nearly resemble a gun station and cockpit. When folded, these protrusions run parallel to the instrument’s body, making the entire system portable and easy to carry around. With its maroon-like shadings, the cello would stand well in a formal concert setting. It would match a black tuxedo or a white-shirt-black-pants combination, and would provide the user with an air of fashion and formidability. The sounds that the instruments proclaims are notoriously dynamic, as a performer with attention to detail can shape a spectrum of flavors and tones using it; also, metallic tunes can belt out of the object’s body, putting the instrument in line with the most resonant ones heard today. Amidst the standard frequencies released by the stringed instrument is the SVC210SK’s unique one, namely, that of cool profoundness. The electric cello is subtle and sweet in its musical language; however, when listened to carefully, its deep honor can be heard, despite its humility. This cello has a dark sound that, though reverent, can sing of passions that can rile even the most complacent of hearts. Though the cello has a resonance interior, its acoustic tone does not bear the full weight that its amplified sound does. But, if the owner desires quiet, personal practice, he can achieve that by plugging headphones into the cello’s output, located in the body’s back. The outfit that Yamaha includes the cello in contains a pair of the brand’s headphones with a stereo plug attached, guaranteeing precise, clear, and fine sound to be heard when plugged in. Batteries, for powering the cello’s active pickups, are also components of the set, alleviating buyers of additional shopping needs. An output for a quarter-inch cable is included, and an auxiliary cable output and cable have places in the package. The pièce de résistance of the combo is the super-sturdy, thick, and zip-capable gig bag. 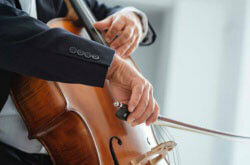 It is shaped long and thin, giving regular cellists a relief from the burdens of most cases meant for acoustics. Straps are also included, making packing a convenient ordeal. The SVC210SK is an expensive instrument. However, as Yamaha includes loads of accessories with the thing, the purchase is certainly worth it, and buyers will not regret their decisions. In becoming deeply involved in music, one tends to forget that the visual aspect of a performance is essential to the audience’s enjoyment. So, often, hair is left frazzled, collars are seen ruffled, and faces go unshaved. Clothing items are sometimes left uncared for, giving performers what some call ‘composer’s appearance’. One thing that is almost never left unchecked, though, is the instrument being used. This important feature is the primary attribute of the user; if it is in poor shape, the solo will likely be, too. The makers of the Bridge Draco Series Cello had this in mind, and crafted their product to look unlike others brands’. The main distinction that this model gives its cellos is color and visual texture. The options of red, blue, purple, and green provide a striking contrast between the blacks and browns of other instruments, while the marble surface of the object makes it glisten as a statue carved from gem. In sunlight, the cellos are brilliant items, and are sure to catch the eyes of passersby, whether in sun-filled park or dim museum. The head and body of the musical objects are alike in skin tone, granting the cello an undeterred appearance of a diamond in the rough. The cello’s body also stands out, amongst that of both other electric cellos and acoustic ones, though it more closely resembles the latter. It is formed by the round and wavy shape that acoustic cellos retain, though its trough and crests are further apart than others’. The middle-body is carved deeply toward the neck of the instrument, giving the object an animated, near-cartoon feel. 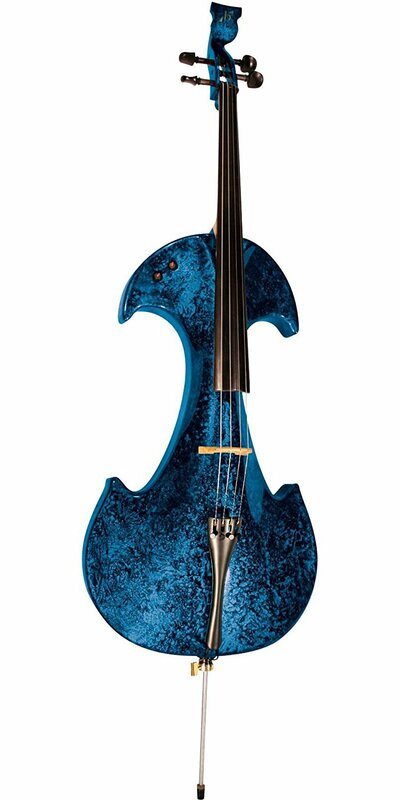 The various colors each characterize this shape in its own way; the red tone makes the cello appear as a royal red carpet, while the blue hue makes the instrument look like a Disneyland fairy’s dress. With its color options and shape, the cello does not fit well in a regular live ensemble setting. It is a distracting piece of equipment, and will certainly steal anyone’s gaze. This said, though, the instrument is excellent for solo showcases or for entertaining YouTube videos. It is a fun object to bring to a birthday gig, and can entice excitement from a young girl whom a parent wishes to teach. Gleaming-ebony fingerboard, tailpiece, and tuning pegs, as well as a light-beige bridge, give a sense of standardization to the instrument, though these assets are not sufficient to grant the cello a place amongst a standard orchestra. The tone of the cello is as its color might suggest – pretty and witty, bright and at the forefront of a soundscape. Though low and bass-empowered, the cello’s tone rings through the sound of an ensemble, large or small. It can shine over the harmonies of violins, and can hold the weight of the entire upper string section. When the cello is plugged into an amplifier, its volume and tone can be controlled by the user, through knobs on the instrument’s front surface. Though Bridge’s Draco Series cellos are full-bodied, they do not have the acoustic capacities of non-electric instruments. They can, though, be used for personal, near-silent practice, while a performance is being anticipated in the dressing room. Draco Series cellos have active pickups that require 9V batteries. The cartridge allows for easy and quick replacement, giving professionals the speed they need to perform on time. Each cello is of average length; a first-time electric cellist should sense only a small difference in the method of holding the instrument. Bridge offers a case along with each cello, freeing buyers from the hassle of shopping for more necessary items. Draco Series cellos rest on the high side of the electric cello price range. However, their unique color, their bright and clear sound, and their acoustic cello-like playability make them well worth looking into, and establish them as equipment not to be disregarded. For those searching for a less expensive option, Ammoon’s I4A1 electric cello is a superb option. With its black outline of a regular cello body and stylized handle bars extended from its middle, the instrument is easily recognizable, and can be seen as a cello with no questions asked. The straight-black color of the object gives it a standard quality, enabling it to fit subtly in a Broadway pit orchestra, or in a string ensemble during a rock show. The near-entirety of the cello is black, granting it a serious disposition, and allowing its electrical capabilities to be what speaks on its behalf. Tone and volume knobs abide on the back of the instrument, allowing for quick and easy manipulation by the player. The cello runs through active pickups, and, as such, requires batteries for full usage. The sound of this instrument is full and warm, providing crisp clarity for listeners, and giving easy-on-the-ear frequencies for beginning users. The sound capabilities span from dampened tones to bright and perky ones; though the cello does not produce incredibly unique tones, it speaks well as a young student’s instrument, and is offers a range of frequencies to delve into. The I4A1 cello is a wonderful option for musical novices, as well as for those seeking a cheap way to experiment with electric instrumentation. Ammoon’s package comes with a plethora of items: an auxiliary-to-quarter-inch cable, extra strings, a cleaning cloth, rosin, an attachable, chromatic tuner, and a soft case are only some of the accessories that the company includes. For about $215, Ammoon’s I4A1 outfit is an excellent deal, and is definitely suitable for any cello taro looking for a secure thrill. Another option for users who have a slim budget is a cello pickup. This handy device can attach to an acoustic cello and connect directly to an amplifier. For a player who owns an acoustic cello, this alleviates the hassle of buying a whole new storage-consuming unit and of acclimating to an unfamiliar fingerboard and body texture. 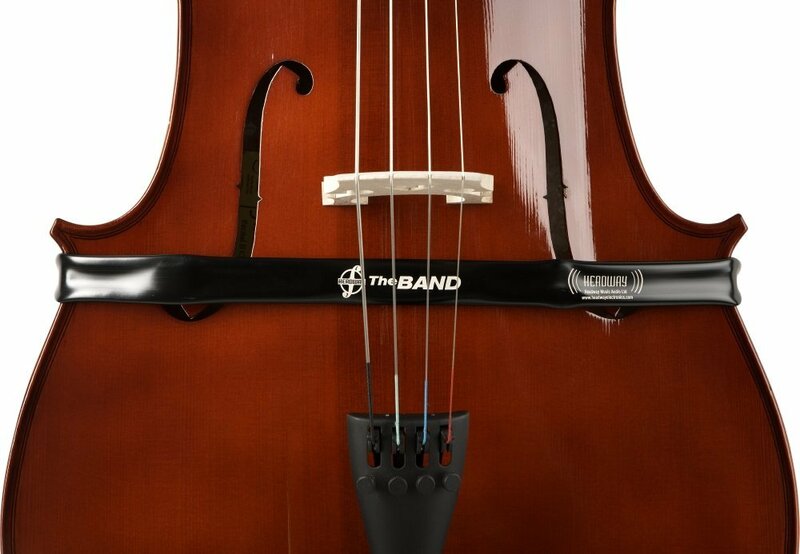 Headway’s The Band is a simplified and convenient version of the standard cello pickup. Utilizing Velcro to stay on the instrument, it does not require any musical object modifications; replacing it is a breeze, and moving it between instruments should prove no problem for any user. Also, it is a passive pickup, and thereby does not require batteries for power. The device is long-lasting, as it is large enough to stay in sight and slim enough to store safely. Users will find it ultra-easy, and will appreciate the option as a replacement for an entire instrument. Overall, Hardway’s cello pickup is great for any user, be she beginner or expert. It is a simple item that requires close to no hassle in placing and displacing, and that picks up the wide range of frequencies that cellos produce. This pickup is essential for anyone who wants to keep his cello’s full-bodied, acoustic tone, and wants to be heard in a large-concert environment. This phenomenal piece of equipment is almost a novelty, rather than a practicality. Its six-stringed design is slim, being composed only of the middle, vertical body of the normal acoustic cello. Its ebony fingerboard is marked with finger placement indicators, so that users can hit notes accurately. The instrument’s color is a light-brown, provoking thoughts of a tree’s skin. The object’s tuning pegs and bridge are black – unusual colors, for the average cello. The CR6 is a beautiful item, equipped with tone and volume knobs and an active pickup for maximum signal output. This electric cello is near the top of these instruments’ price range, but, for those looking for something truly unique, artistic, and natural, the instrument is advantageous, even for its price. Electric cellos, though relatively new phenomena, are available abundantly, and are readily available for purchase from in front of a computer screen. They come in tons of shapes, colors, and sizes – anyone with something particular in mind is bound to find what they seek. Instrument-crafting, since, perhaps, it began, has been an art form; this quality has endured and evolved, and cello-carvers provide no exception. Many modern electric cellos are archetypal art objects that their makers boast proudly about. Buyers will be pleased to discover that, as well as serving as excellent performance tools, the electric cellos can stand as decorative items, giving pleasant eye-candy for anyone lucky enough to lay eyes on them.